The blood brain barrier serves as the brain’s protection from its environment. It separates the circulating blood from the cerebrospinal fluid. The endothelial cells in tight junction create the boundary between the two fluids. They are responsible in restricting the flow of substances in the area. The projections of the Astrocytes, called the astrocytic feet or the glia limitans, surround the endothelial cells, providing the much needed support. Paul Ehrlich is the person responsible for the discovery of the blood brain barrier. While he was studying the process of staining, he noted that all organs in the body of his subject animal took the stain and became visible under the microscope. However, the brain did not take the dye injected. Although he had no clear understanding of the phenomenon, he attributed the reaction to the lower affinity of the brain to the dye. Later on, Edwin Goldman injected the dye into the brain and found that the stain remained in the cerebrospinal fluid. This experiment clearly showed the presence of compartmentalization, thus the blood brain barrier became known. 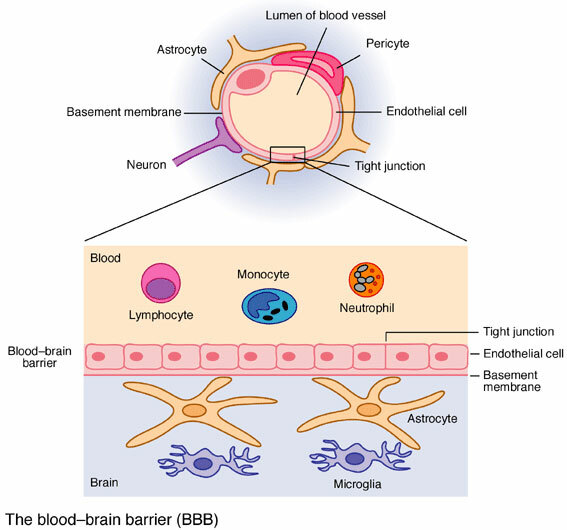 The blood brain barrier is a semi-permeable passageway between the circulating blood and the cerebrospinal fluid. The endothelial cells in the BBB restrict the entry of microscopic objects like bacteria and macroscopic molecules into the CSF while allowing the diffusion of small hydrophobic substances like the oxygen, carbon dioxide, hormones, electrolytes, protein, and glucose. The blood brain barrier effectively protects the brain from bacterial infections. Because of its function, brain infection is very rare. However, the supposed protection can also be a problem if medication and drugs are to be administered. The antibodies and antibiotics are too large to cross the BBB, creating a challenge for physicians. Therefore, if you suffer from brain infections, it can be very difficult to treat due to the blood brain barrier.